For more than 45 years, Kevin E. Gallagher has provided criminal defense representation in high-profile, high-stakes criminal cases throughout Southern California. When you need a determined advocate to protect your liberty, your reputation, and your career, I am prepared to fight for your rights. I have represented several thousand accused persons and tried more than 300 cases to juries, including a large number of homicides. If you are under investigation or have been arrested, I give your case the close, personal attention it deserves as I work tirelessly for the best possible resolution. 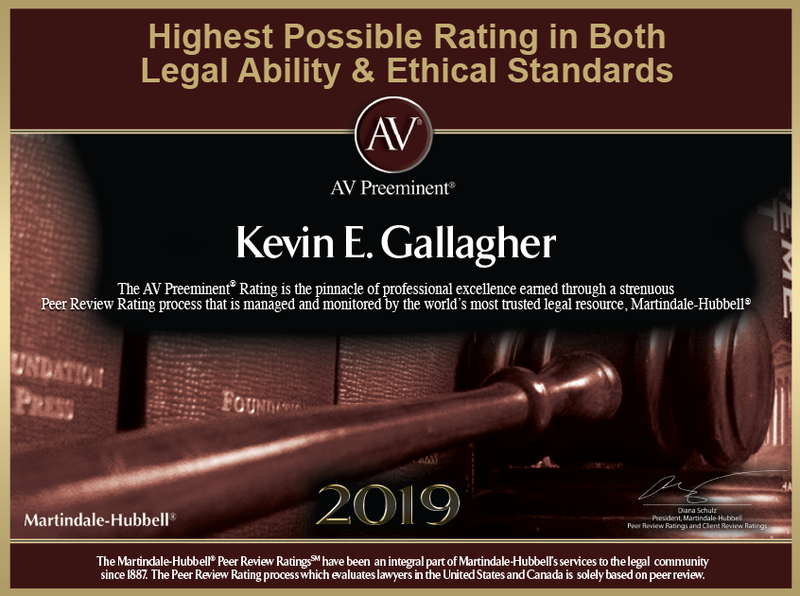 Professional — Among many accolades, I have been selected to the California Super Lawyers list for each of the last 10 years, and I am AV® Preeminent™ Peer Review Rated by Martindale-Hubbell® for my high ethical standards and professional ability. Discreet — I guard your privacy to minimize collateral damage to your reputation, personal relationships, and career. Ethical — I have a reputation for integrity and trustworthiness that helps me operate as an honest broker for my clients. I have assisted a wide variety of professionals during the investigative stage of cases that included white collar crimes, insurance fraud, and health insurance fraud. In the investigative stage, I can present evidence that no crime has been committed or that potentially illegal activity occurred without criminal intent. It is sometimes possible to reach a settlement with authorities that avoids the filing of criminal charges altogether. In addition to assistance with criminal investigations, I also represent professionals before licensing boards to protect their livelihood. White collar crimes — Traditional white collar crimes are usually theft crimes that involve professional-level skills and access to someone else’s funds. However, this category can also include nonviolent economic crimes such as money laundering and identity theft. Federal crimes — Federal crimes generally carry more severe sentences than similar state crimes. Defendants also face aggressive investigation and prosecution by highly trained professionals, making it imperative that you have capable defense representation. Medicare and Medicaid fraud — Failure to comply with overly complex federal regulations can easily turn a conscientious healthcare provider into a felon. I fight to protect your rights, reputation and career in Medicare and Medicaid fraud cases. Serious felonies — I have defended numerous clients accused of serious felonies, up to and including homicide. If you retain my services, you can count on my experience and determination as I fight for the best possible outcome. When your freedom, reputation, and career are on the line, Kevin E. Gallagher is prepared to protect your rights. I draw on more than 45 years of experience to build a compelling defense to the most serious criminal charges. To schedule a free consultation, call 714-757-8607 or contact my Santa Ana office online. If you are aware of an investigation, don’t make the mistake of waiting until you are charged; call today. Kevin E. Gallagher is located in Santa Ana, CA and serves clients in and around Corona Del Mar, Costa Mesa, Newport Coast, Yorba Linda, Foothill Ranch, Aliso Viejo, Irvine, Silverado and Orange County.